The UltraSieve Midi is a Gravity Fed pre-filter to filter waste solids from the water via a bottom drain or through a skimmer. This technique is based upon the very successful Ultrasieve III, which incorporates a sieve-bend. A sieve-bend consists of hundreds of sharp stainless steel profile wires with very small slot openings where the water can go through but the solids stay on the sieve bend. In practice it works as follows: The water enters the Ultrasieve Midi via the Ultraskim or bottom drain and passes through the “auto-adjustable” dam and will go upwards and fall over the weir on to the Stainless Steel sieve-bend. The water goes through the sieve bend and the waste solids will slowly go down to the waste area. At the waste outlet of the filter is a 2 inch male thread connection with end cap for attching a 2 inch slide/Ball valve to easily wash away the waste with water. When the water in the tank underneath the sieve-bend is not pumped away fast enough the water will raise which makes the floating system (auto-adjustable dam) go up to reduce the incoming water flow. The pump will be connected to the 2 inch male thread with 63mm PVC fitting supplied. You can use a self-priming pump like a Sequence 12000S Pump or Speck Badu Top or a submersible pump that can be used out of the pond like the Oase Aquamax Eco 12000 or Oase Aquamax Start 8500 Pump. 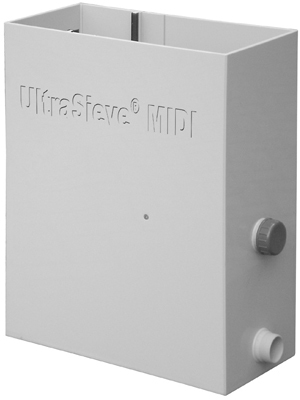 An extra advantage of this Ultrasieve Midi pre-filter is that the water will be provided with extra oxygen, when it goes through the slots. Plus the mechanical waste is removed from the water itself. Gravity fed from a bottom drain or skimmer make sure the upper edge of the UltraSieve Midi is 1 cm higher than the maximum water level, also its important to make sure the UltraSieve Midi is on an equal, level, ground. Between the bottom drain and the UltraSieve Midi or a skimmer and the UltraSieve Midi we strongly advise you to use a slide valve or ball Valve to separate the UltraSieve Midi from the pond when necessary. The inlet of the UltraSieve Midi is made of 110 mm Polypropylene pipe so you can use one of our rubber boots to join the two together. Since the UltraSieve Midi is made of Polypropylene you cannot make any glue connections. The UltraSieve Midi has 1 inlet of 110 mm. The UltraSieve Midi has a floating system to prevent the water in the area under the sieve from rising above the level of the sieve for low speed pumps and also to prevent the water from going too low to be primed for high speed pumps. The floating device can be adjusted. You only have to do this once when installing the UltraSieve Midi or when you change pumps. To remove the waste that is on the surface of the UltraSieve Midi (every day) is very easy by opening the waste outlet and to rinse the waste away with a normal hosepipe. Another method to have water run over the screen is pushing down the adjustable dam, which will flood the screen with water. When the adjustable dam is in a low position already because of the pump speed you can pull up the dam for a short while and push it back downwards again. To remove the waste that has gone into the profile wires of the UltraSieve Midi (only when necessary) you will need a hosepipe with a powerful spray nozzle or a high-pressure machine. For this way of cleaning you have to place the sieve in an upright position or take the sieve out of the unit. After a certain period of time the sieve can get “fat” and this will make it more difficult for the water to go through. You can clean the sieve with i.e. alcohol. Note: when you use the sieve for the very first time the surface of the sieve can also be covered with a very thin film. Make sure you clean the sieve very thorough with alcohol before using it. The maximum flow of the UltraSieve Midi is 12000 lph. Comes with a 300 micron Stainless Steel screen. The perfect solution for pump capacities up to ±12m³/h. (12000 lph) The most ideal pre-filter! Create a compact filter system by combining the UltraSieve MIDI with a beadfilter or other pump fed filters. The pump connection comes with a long suction pipe which draws the water from under the float to prevent air suction. AquaForte introduces the new Smart Sieve, a breakthrough in production technology and price range! The new innovative filter is a gravity fed Smart Sieve produced by means of a special technique of rotation moulding of the casing of the filter in one piece. This gives the filter added strength and a clean look, as well as modern production means bringing the price down compared to traditional sieve filters. The Smart Sieve can therefore sit at a very attractive price in the market. The Smart Sieve is completely made of polyethylene and fitted with a 300 micron stainless steel filter element. 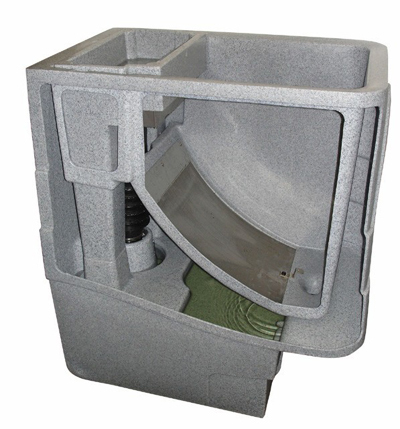 The Smart Sieve filter is supplied with a lid as standard and comes with 2 x 110 mm Dia inlets, meaning two drains or one drain and a skimmer can be mechanically filtered, lifting waste from the pond automatically. 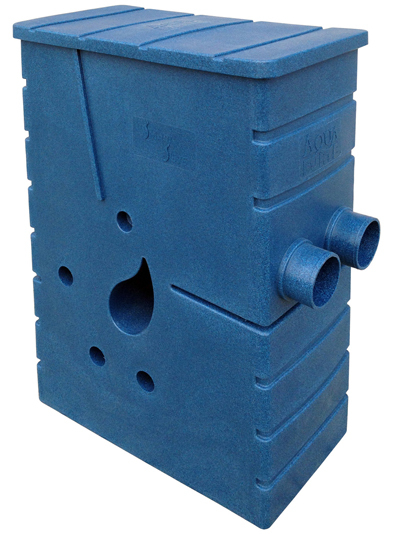 Polyethylene manufactured gravity sieve filter. Equipped with a 300 micron stainless steel filter element. Pump capacity ± 25m ³ / h.